The GoPro has finally announced GoPro action camera which is the most wanting, lightest and easy to carry even in pocket and hence it is the smallest and lightest action camera so far. It is approximately half- in -size and weight compared to its predecessor HERO4 Black and Silver cameras. The camera records HD videos @ 60fps and can captures full HD videos @ 30fps. It can take breath in water at the depth of 33’ (10m). It is easily controlled by one-button for both capturing video and time-lapse photos and hence improves the speed of capturing the memorable moments of the users. It can capture 8MP Single, Burst, and Time Lapse photos in impressive mode. It has Dual Mic system which captures improved audio during fast blowing of wind and the action based on water activities by reducing the noise formation during period. It features Built-in WiFi and Bluetooth through which the users can easily connect to GoPro App and Smart Remote for fast processing. Its Auto image rotation offers the users the correct image orientation during recording so that they feels relax during capturing image. It also features a New Ball Joint Buckle in the device mount, so the users can capture the stills and videos from a bit different perspective. HERO4 Session is compatible with the present GoPro mounts. The users have to pay $399.99 MSRP to get the Hero4 via authorized GoPro retailers globally and also it will be available on GoPro.com beginning July 12, 2015. SAN MATEO, Calif., July 6, 2015 /PRNewswire/ — GoPro, Inc. (NASDAQ:GPRO), enabler of some of today’s most engaging content, is proud to announce HERO4 Session, the smallest, lightest, most convenient GoPro yet. 50% smaller and 40% lighter than GoPro’s best-selling HERO4 Black and Silver cameras, HERO4 Session packs GoPro’s Emmy® Award-winning image quality and performance into an exciting new low-profile form factor. HERO4 Session benefits from a durable waterproof design that eliminates the need for a separate housing and features simple one-button control to make capturing immersive photos and video quicker and more convenient than ever before. HERO4 Session is compatible with existing GoPro mounts and will retail for $399.99 MSRP at authorized GoPro retailers around the world and on GoPro.com beginning July 12, 2015. HERO4 Session captures GoPro-quality 1080p60, 720p100 and 1440p30 video along with eight megapixel photos in Single, Burst and Time Lapse modes. It features many of the same innovative features found in GoPro’s best-selling HERO4 Black and Silver cameras, including SuperView™, Protune and Auto Low Light recording modes. An expanded set of controls and settings can be accessed when using the GoPro App or Smart Remote. Operating HERO4 Session is very simple. A short press of the shutter button quickly powers the camera on and video recording begins automatically. A long press of the shutter button powers the camera on and triggers Time Lapse photo capture. Press the shutter button again to save video or photo content and power the camera off. This simple one button design drastically improves the speed and convenience of capturing life moments as they happen. 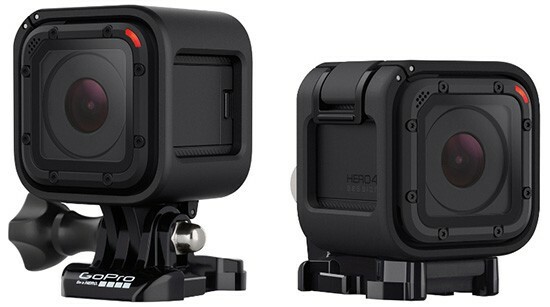 HERO4 Session is built to GoPro’s famous rugged standards and is waterproof to 33 feet (10 meters). It features a sleek frame mounting system that is compatible with GoPro’s expansive array of mounts. An innovative dual microphone system dynamically switches sound recording between microphones to reduce wind noise during activities. Audio performance during water-based activities has been dramatically improved thanks to HERO4 Session’s waterproof design that eliminates the need for a separate water housing, which can often muffle sounds. “At GoPro, sound quality is as important as image quality and we’re very excited about the stunning audio advancements we’ve made with HERO4 Session during water-based and windy activities. It’s incredible what this little GoPro can capture,” remarked Woodman.